The manysidedness of his universally recognized talent, and the spiritual force that guided his hand and his mind, made Leonardo da Vinci one of the most acclaimed figures in the world of art and intellect and the person who marked the beginning of the High Renaissance period in Italy. Endowed by an artistic and scientific curiosity, he searched and created in almost all fields of human potential, as it was known at his time, excelling in art and science. His motto was "Saper Vedere", "knowing how to see", and his eyes were the gateway to knowledge and creativity, as he believed that any phenomenon that could be perceived was an object of knowledge. Combined with an unusual intellect, his art of drawing, his whole artistic creation and his imaginative inventions, which were hundreds of years ahead of his time, are all invaluable heritage of humanity. He left to posterity a multitude of works to admire and use as an inspirational example and a starting point for further creativity. Leonardo was born on April 15th, 1452, in the town of Vinci near Florence, Italy. He was the illegitimate child of a well-known Florentine notary, Ser Piero, and Caterina, a young peasant woman. Leonardo was brought up in his father's house and received the normal elementary education of reading, writing and arithmetic, but he became involved with higher mathematics and the in-depth study of the Latin language later in his adult life. His artistic inclination appeared very early in his childhood, and that was the reason why his father apprenticed him to Andrea del Verrocchio's workshop in Florence, in 1466. At that time, Andrea del Verrocchio was a very successful artist and several famous painters apprenticed or worked with him. In his workshop, young Leonardo had the chance to acquire a wide variety of skills and deal not only with painting and drawing, but also with sculpture, plaster and metal casting, and he learned the basic principles of chemistry and anatomy. When Verrocchio was creating his painting "The Baptism of Christ", Leonardo was assigned to paint an angel, and it was then that his early mastery was revealed. It is alleged that Verrocchio decided never to paint again when he realized how much better Leonardo's painting was. In 1472, he became a member of the Painters' Guild in Florence, but he remained at his teacher's workshop until 1477, and then he started working independently. His creative imagination, together with his remarkable talent are apparent in his early works like his two "Annunciations," the "Madonna and Child," the "Madonna Benois," and the "Portrait of a Young Lady." There are also two great paintings that remained unfinished: "St Jerome" and the "Adoration of the Magi," which were commissions of St Donato's monastery in Scopeto. From this early period a large number of superb drawings are left, among which many technical sketches for military weapons and several mechanical devices. In 1482, at the age of 30, he left Florence to enter the service of Ludovico Sforza, the Duke of Milan. It is said that the deeper cause for his departure was probably the prevailing spirit of Neoplatonism in Florence. Leonardo's mind was experience-oriented and Milan's academic, more liberal and more realistic atmosphere must have been a strong pole of attraction for him. During this phase of his life, along with painting and sculpture he designed the court festivals and acted as a technical adviser in military matters, and highly contributed in architecture, fortification methods for the town, and mechanical engineering. While some of his works, like a monumental equestrian statue, remained unfinished, there is a great number of impressive sketches left, which reveal the boldness of his conception. Leonardo also maintained a famous workshop in Milan, where in collaboration with his students and assistants, some of his famous paintings, like "La Belle Ferronniere," "Lucrezia Crivelli," and "Madonna Litta," were created. 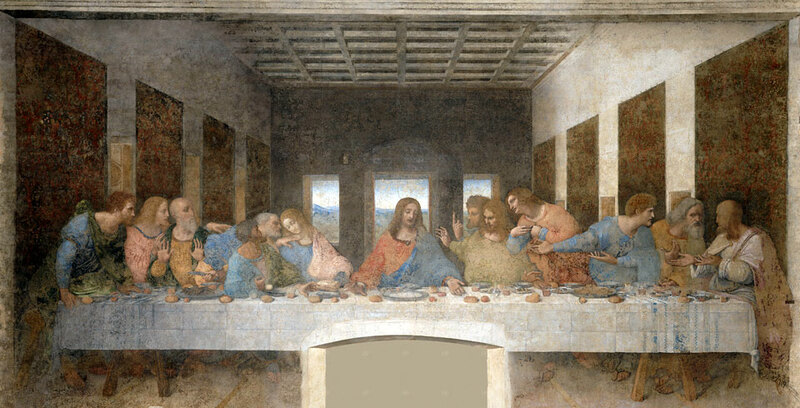 However the most astonishing of his paintings, which took him about 4 years to complete, was "The Last Supper" on the main wall of the refectory of Santa Maria delle Grazie convent, in Milan. "The Last Supper" is one of the most outstanding paintings in the world due to its striking contrast between the attitudes of the disciples and Christ's, the seemingly simple arrangement of the disciples, the loneliness of Judas, and the serenity of the expression on the face of Jesus, who is the only one who knows how his divine mission is going to end. Up to date, the painting has been a source of influence and inspiration for succeeding generations, and for painters as great as Rembrandt and Rubens. When the second Italian war started in 1499 and the French troops invaded Milan, Duke Ludovico Sforza fell from power and Leonardo, with a couple of assistants and friends, travelled, first to Venice, and in 1500 back to Florence, where he painted "The Virgin and Child with St. Anne and St. John the Baptist." In 1502, Leonardo entered the court of Cesare Borgia and together, they travelled extensively all over Italy and Leonardo created several topographical maps that opened the way for modern cartography. In 1503, he returned to Florence where, he received a commission to paint a huge mural called the "Battle of Anghiari." Although he worked on it for three years the painting was not completed. However, during this period he created the painting that is thought to be the most famous in the world, the "Mona Lisa." 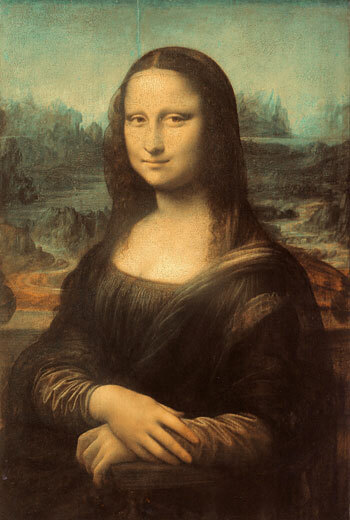 There are many theories as to who the sitter with the enigmatic smile in the painting was, but the most possible one is that the painting was a commission of a wealthy merchant named Francesco del Giocondo, to create a portrait of his wife Lisa del Giocondo. Leonardo stayed in Florence until 1506 and he had the opportunity to extend his knowledge on anatomy, the structure and functioning of the human body by performing dissections in the hospital of St. Maria Nuova. Additionally, he observed the flight of birds and conducted hydrological studies on the nature and physical properties of water, the movement and the laws of currents, in comparison to the laws of air currents. His drawings of flying machines are amazingly similar to the first aeroplanes and helicopters. During his second period in Milan from 1506 to 1513, Leonardo did very little as a painter. He mostly worked on anatomy and human physiology and his manuscripts of that period are full of mathematical, mechanical, geological and botanical studies that had to be parts of his "perceptual cosmology." For three years after leaving Milan, Leonardo, who was now 60, lived and worked in the Vatican at a period when Donato Bramante, an old Leonardo's friend, was building St Peter's Cathedral and Raphael was decorating Pope's new residence. Those were some very lonely years and Da Vinci had very little to do, except for strolling along the city's streets and surveying ancient monuments while working on his mathematical studies and conducting technical experiments. Not being able to stand idleness and loneliness and despite his 65 years, Leonardo accepted the invitation of king Francis I to go to France and in 1516 he left Italy forever, with his most devoted pupil, Francsesco Melzi who was to become the heir to his artistic and scientific legacy. Leonardo was given freedom to draw up plans for the king's palace and gardens and extensively worked on landscape architecture ,and spent the remaining three years of his life at the small palace of Cloux, near Amboise, where the king's summer residence was, bearing the proud title of "king's first painter, architect and mechanic." The Great Master died on May 2nd,1519, at Cloux, and was laid to rest in Saint Florentine's Royal Church. According to his biographer, Giorgio Vasari (1511-1574), Leonardo da Vinci was a man of strict moral character with respect to the divine nature of humans and animals, a vegetarian and a lover of nature, but in conflict with the church because of his Natural Philosophy. His legendary figure continues to be a source or inspiration for artists, scientists, philosophers and scholars up to this day. From the depiction of his Vitruvian Man on the Italian Euro, to Dan Brown's novel The Da Vinci Code, and its film version, Leonardo's personality, a genius of universal recognition, will continue to fascinate lovers of art and science all over the globe.